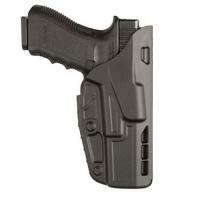 Conceal a firearm, or proudly display it with the Safariland 7TS ALS Concealment Belt Clip Holster Model 7379. The new 7379 is ideal for tactical professionals, or active shooters looking to upgrade to a locking holster. The Safariland ALS® (Automatic Locking System) instantly engages upon holstering, locking weapons securely into place for Level III security. The open-top design allows for an uninhibited quick draw. The proprietary nylon blend, SafariSeven,™ renders this holster extremely resilient to nearly all elements and able to survive daily wear. Able to withstand temperature extremes from -50 to 300 degrees F, as well as indefinite water submersion without losing its shape, the model 7379 can be taken into any field condition. Whether shooting in Alaska or running across the Saharan desert, be certain your firearm is at your side with a Safariland holster. Fits great and secures my G 26 very well. Great holster, I wish it sat just a little lower on the belt.